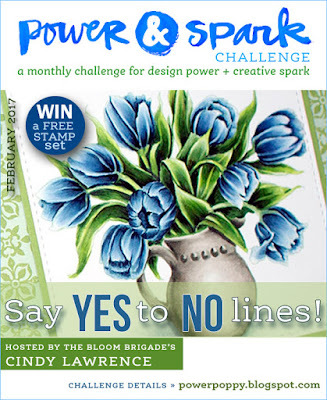 Today I am delighted to show off some elegant roses for our newest challenge at Power Poppy, called Say Yes to No Lines. Cindy has given us a No-Line Colouring Challenge! With Valentine’s Day coming soon, I thought I’d create a love-themed card, showcasing some beautiful no-line roses. I stamped the roses from My English Rose set onto Copic XPress it Blending Cardstock using Toffee Crunch ink, so that once I started colouring, those lines would disappear due to the ink being much lighter in colour. It takes patience, and a bit of a slower hand to get the accuracy with no-line colouring, but the results are so lovely and unique. It ends up looking more like a straight illustration than a stamped image. I stamped both of the roses in the set to colour, one of which is attached to a “note”. When I cut the roses out, I just elimated the note. By doing that it looks more like a rose bush with smaller and larger roses, including some pretty buds. 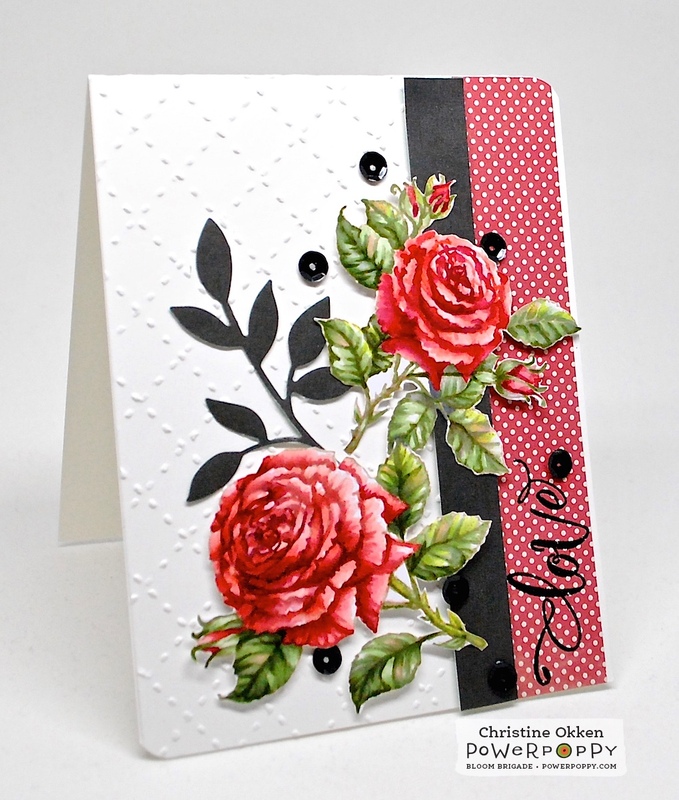 On the white background layer I used my Scor Bug and Scor Buddy to create the raised dotted lines to give you the feeling of a trellis for the roses to climb on. I embossed the word “love”in black onto the patterned paper, added a pretty leafy die cut from the same patterned paper as the strip and then some black sequins. Here’s the Copics I used below. And then come join us in the month long challenge colouring without the lines! 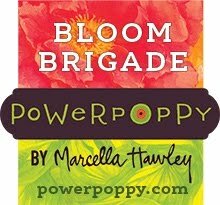 You could win a Power Poppy set of your choice! Beautiful Christine and wonderful job on fussy cutting! Now this is gorgeous! Look at those roses.... Christine you sure know how to color with no lines too. Fantastic texture, great detail cutting (my favorite) and gorgeous card. Wow, what gorgeous roses on a beautiful card. Your coloring is fabulous. Love all the details on your card. Oh, my wow, this is truly beautiful! 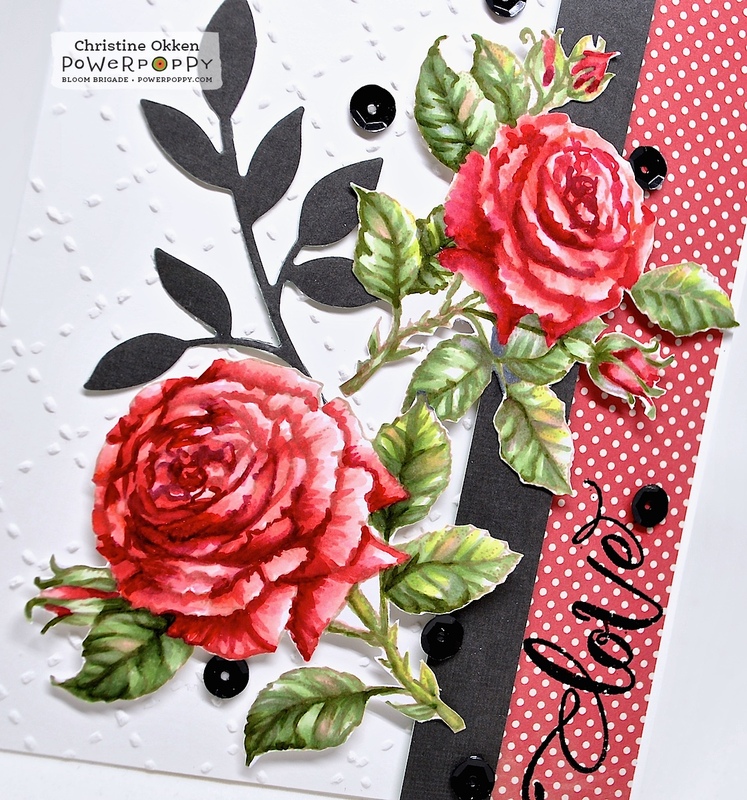 Your no-line coloring is off the charts, and a lovely card design to show the roses to their best advantage. I love how you combined the two rose images, and the script on the "love" is so pretty! Oh my goodness! These just get better and better! Beautiful creation...thanks for sharing!!! Your work is exquisite Christine! Love this card. What an amazing card, Christine. Roses are my favorites and your is colored so beautifully. Oh wow, outstanding, gorgeous coloring, so life like! Be still my heart! These are the most spectacular roses ever! The black leaf accents were so unexpected but sensational.